Nikos, a 4.25-year old English Cream Retriever, first came to CPT in July 2015 to resolve leash walking and recall problems. CPT’s in-home private lesson and board train programs promptly achieved lesson plan obedience goals both on and off-leash. However, his owner still sought a way to improve Nikos’s obedience further, as well as his socialization, general confidence, and overall quality of life. Therefore, in August 2016, his owner enrolled Nikos in his first dog agility class. 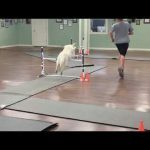 Beginner Agility introduces dogs to the various agility obstacles: broad jump, single-bar jump, double-bar jump, triple-bar jump, tire jump, pause table, open tunnel, a-frame, dog walk, teeter, and weave poles. At the conclusion of Beginner Agility class dogs should be proficient in all the preceding obstacles, except the teeter and weaves, which require more time. Nikos, however, had other “obstacles.” He was innately an anxious dog who exhibited nervous behavior amidst unfamiliar people, energetic dogs, and narrow, elevated, and/or wobbly surfaces. Consequently, although he quickly enjoyed jumping, he was apprehensive entering the tunnel and petrified climbing on the dog walk or teeter. Yet, those barrier presented opportunities. CPT communicated the impact dog agility class can have on anxious animals. The proximity to people and dogs in the group class environment enhances socialization development. The physical activity inherent to dog agility improves strength, speed, flexibility, coordination, body awareness, and emotional confidence. The environmental obstacles (jumps, enclosed spaces, heights, pitches, narrow walkways) in dog agility improve confidence and proficiency when encountering novel places, terrains, and objects when hiking, while on walks, or inside a home. Kyle and Nikos during Advanced Agility class. Nikos had difficulty the first 6 weeks of Beginner Agility, but had a “eureka moment” the last 2 weeks of class. During each of week 7 and 8, instead of panicking Nikos more comfortably accepted challenges. CPT’s acumen employing systematic desensitization, controlled flooding, general anxiety reduction, motivational, behavior shaping, and human-dog leadership communication methodologies adeptly expedited Nikos’s progress. His owner observed the tangible progress and how the benefits of dog agility extended beyond CPT. Nikos became more confident and obedient inside her home and while walking in the neighborhood. Therefore, in October 2016 she enrolled Nikos in Intermediate Agility. Intermediate Agility teaches handlers the mechanics and communication techniques required to navigate their dog through a series of obstacles. In addition, we obtain competency in the teeter and weaves during Intermediate Agility. The process of figuratively flying over a series of jumps per the hand, shoulder, and voice commands of a handler improved Nikos’s general attentiveness and off-leash obedience. The continued work mastering the teeter improved Nikos’s overall confidence. Similarly, his exposure to his CPT instructor, other class owners, and class dogs improved Nikos’s overall composure around persons and dogs. Dog agility was transforming Nervous Nikos into a mature, confident, happier Nikos. Upon the conclusion of Intermediate Agility and Intermediate Agility-2, Nikos had mastered pivots, front crosses, rear crosses, and the go and out signals. Moreover, he raced over the jumps and through the tunnel, became more confident on the dog walk, willingly, albeit tentatively, completed the teeter, and increased speed and accuracy on the weaves. Consequently, in May 2017 his owner enrolled Nikos in CPT’s Advanced Agility program. Advanced agility teaches handlers how to navigate their dogs through courses of increasing complexity. After several sessions of Advanced Agility human and canine students should be ready to enter competitions and achieve titles. Otherwise, they can continue the course simply to have fun and experience the myriad of training benefits inherent to dog agility. Nikos is now entered in his 9thsession of Advanced Agility. As you can see by the video accompanying this article, Nikos’s agility skills are now outstanding. He works fast and from a distance, accurately navigates complex courses, and does it all with joy and confidence. More importantly, for Nikos dog agility has been a life changer. He no longer is timid around people or dogs. Rather, he is now conspicuously social. He is no longer afraid of noises, heights, inclines, declines, narrow walkways, wobbly surfaces, or novel objects. The preceding is true regardless of whether he is on an agility course, walking in the neighborhood, or on a hike. He is fitter, faster, more athletic, and healthier, both physically and emotionally. Agility has done wonders to improve Nikos’s quality of life. Conjunctively, dog agility has significantly improved the pleasure his owner receives from Nikos. There is superior bonding. Moreover, now that Nikos is more confident and better-behaved off-leash, they can enjoy many more activities together. If you believe that dog agility may similarly benefit you and your pet, we recommend signing up for a CPT group agility class. Prerequisites are Beginner Obedience or an equivalent, although Intermediate Obedience is preferred; reliable housebreaking; proficient off-leash obedience; and no history of aggression to people or dogs. If your pet does not meet all the prerequisites, your schedule does not allow for group class, or you prefer individualized or more accelerated instruction, then we recommend scheduling private dog agility instruction at CPT. To enroll in a CPT group agility class or to schedule a private agility appointment, please contact the CPT office by phone at 404-236-2150. CPT office hours are Monday through Friday from 9 am – 4 pm.